International Conference on Innovations in Infobusiness and Technology (ICIIT) 2016 was held on 4th March 2016 in Ozo Colombo. This conference was organised by IEEE Student Branch of Informatics Institute of Technology (IIT). The conference was technically sponsored by the E-learning and Technical Communication ACM Professional Chapter – Japan Section. The theme for this inaugural conference is “Emerging Tech Trends for Smart Digital Business”. The keynote speakers, Professor Debopriyo Roy and Professor Keitaro Naruse were from University of Aizu, Japan. The conference included both industrial and academic presentations. Industrial presentations session was focused on disseminating and exchanging knowledge on ongoing industry research in computing. Leading software companies in Sri Lanka such as Virtusa, Pearson, 99X Technology, Headstart and Informatics International Ltd. presented their research. 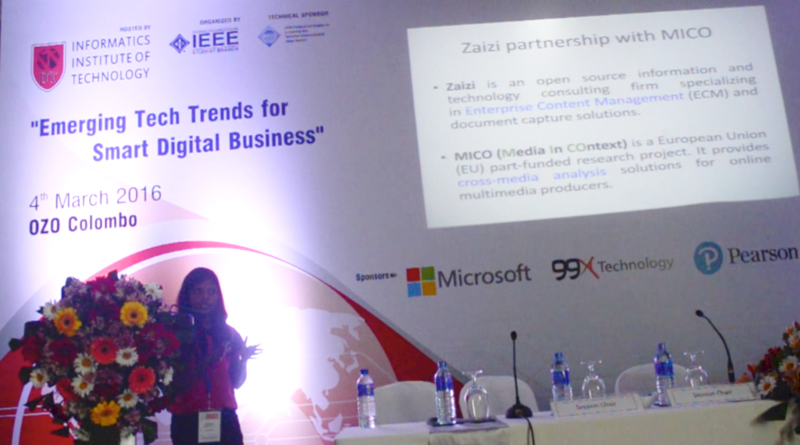 From MICO side, Zaizi presented industrial presentations session on “Intelligent Enterprise Cross media Search” which is an use case of MICO platform. Further, we have demonstrated the MICO platform, core technologies used and other use cases as well.